Doug Bennett ’06S (MBA) (right). Once upon a time in the story of American business, the human resources department was the warm and fuzzy part of a company—necessary for marshaling and rallying the troops, but not always essential to the bottom line. These days, HR is shedding its humble image and stepping to the forefront in a new breed of business. It’s one player in a fresh push to harness the power of all of a company’s functions—from HR to marketing—with a single system that not only boosts the bottom line, but also enriches the lives of its workers. 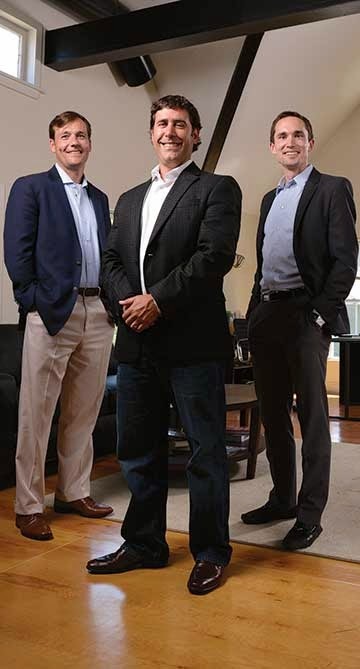 Three Simon School alumni are leading this movement. Their Rochester-based company, Brand Integrity, was one of the first to help companies align objectives with employee satisfaction. “Every day I come to work I know that, with our software, we have the ability to dramatically improve people’s lives—and make companies more profitable,” says Founder and CEO Gregg Lederman ’99S (MBA). Using Potential Point 5.0, Brand Integrity’s cloud-based software, a company lays out its brand (mission, objectives, reason for being), aligns and engages employees (so they can “live the brand,” Lederman says), and creates greater accountability and recognition that in the end improves customer service. Companies license the patent-pending product for an annual license fee. . Potential Point focuses on three areas: With simple, clickable online questionnaires, it measures the motivation and commitment of staff; offers customers a chance to weigh in on their interactions with the firm; and provides social media tools that managers and employees can use to recognize and share one another’s efforts toward company objectives. The software streamlines employee recognition, making it not only easier to provide but more visible and meaningful as well. It creates a conversation between employees and managers, among employees themselves, and between employees and customers. Potential Point is the first software to help firms quantify their culture. The importance of employee engagement cannot be overstated, Lederman says. Polls by Gallup and many others agree: Roughly 70 percent of American workers are not engaged in their jobs. Lederman likens the statistics to a 10-person crew in a boat race: three crew members are working as hard as they can, four are distracted or just relaxing, and three are actively working to sink the boat. “It’s unacceptable that two thirds of employees aren’t engaged,” Lederman says. “There’s a crisis that’s been going on for years. It got really bad during the Great Recession. “That’s the reality of engagement. When your employees are engaged, they speak positively of the company and they’ll stay and be productive,” he says. Lederman, who grew up in Rochester, founded Brand Integrity in 2002. After studying business at Ithaca College, he worked in Texas and California before returning to buy Buckmans Dairy in Greece. He and partner Tim Vottis pared down the product offerings, boosted employee morale, and improved customer service before selling the company. Lederman then used his share of the proceeds to study at Simon. Fascinated with marketing and company branding, he went to work for an advertising agency after he graduated, and quickly learned a lesson: It wasn’t enough for a firm to say it could deliver on promises; change had to happen within first. He wanted to start a business that would help other companies walk the walk and talk the talk behind their brand and launched Brand Integrity in April 2002. One of his first clients was Wegmans Food Markets, consistently a top performer on national Best Places to Work lists. “People at Wegmans know the answer or they know how to get you the answer. And if you need to know where the product is, often they walk you right to it,” Lederman says. Those were heady, creative days, Bennett recalls. Only a few people worked in the firm’s converted Victorian on Park Avenue, and Lederman traveled a lot to consulting engagements. At first Bennett was alone most of the time, managing the first few software clients and serving as liaison between the client and developer. He had done similar work as a business analyst in a suburban Philadelphia trading office. “At the end of the day it really was about making the world a better place. It was great to feel like every hour, every minute I put into this business we get payback. It was such a cool feeling coming out of school applying finance and operations—and marketing,” he says. “I think what motivates me the most is building something—working on a project and seeing it used and enjoyed by employees. I think that’s what all entrepreneurs want: seeing all of your hard work come to life,” says Bennett, a Senior Vice President who now leads Brand Integrity’s technology side. Consulting represented 75 percent of the business at the time; software was bringing in 25 percent. The firm made a decisive and pivotal switch, pouring more resources into Potential Point and focusing less on consulting. Today the software makes up 80 percent of the company and consulting represents 20 percent. Roughly half of Lederman’s time is now spent on the speaking circuit. He has 50 to 85 engagements a year, and this year he is promoting his new book, Engaged! Outbehave Your Competition to Create Customers for Life. The book details the 22 behaviors Lederman considers essential to living the brand. Much of the company’s success will hinge on telling the story of America’s crisis of disengagement. Besides promoting the book and Potential Point through social media, Brand Integrity is giving away access to a portion of the software, called the Engaged Index, to build a database of proof consisting of four simple questions. An employee can go to the website, answer the questions, and click on his or her employer in a dropdown menu. Once coworkers also respond to the questionnaire, a picture will start to emerge—one that shows how engaged the employees of that company really are. Brand Integrity can use the data to show regional and national trends—and build its own database of prospects in the process. “The intent there is to raise awareness of the employee engagement crisis,” Bond says. “It will be a stand-alone, and we’re hoping it will go viral." As the first-ever employee recognition system to quantify engagement, Potential Point has to educate possible clients first. Lederman ranks it among the firm’s biggest challenges. The software’s cross-functional nature also makes it harder to sell. The notion of living the brand is “owned by no one but managed by everyone,” Bond says. Hence, there are various buyers within a company—including marketing, which represents the brand externally, and HR, which is typically responsible for internal employee engagement—that have to agree on a purchase. Those who sign on are enthusiastic. Since the software was launched in 2006, not one of the more than 100 for-profit employers who use the software has voluntarily shut it off, Lederman says. Among clients are the University of Rochester Medical Center, AAA of Western & Central New York, Chobani Inc., Constellation Brands, the Bonadio Group, Excellus Blue Cross Blue Shield, and Five Star Bank. At Five Star, the software helped managers assess their branches. They discovered that offices with the highest loan production figures also had the highest levels of employee engagement, Bond says. Genesee Regional Bank credited the Brand Integrity software for helping it place seventh in the small/medium employers category in this year’s Best Companies to Work for in New York competition. Another client, SavOn LLC in Oneida, thanked Brand Integrity when it won the 2013 American Society for Training and Development CNY Best Award for For-Profit Organizations. The award recognizes a firm that has linked employee learning to the business’ strategic growth or success. Competing products focus on selling rewards; Potential Point focuses on recognition and appreciation and garners 80 to 95 percent employee participation—10 to 20 times the participation rate of other models, Lederman says. In its own office, Brand Integrity is purposeful and busy—but easygoing, almost laid back. Bennett, Lederman, and Bond hint that the sportscoats they are wearing are not everyday attire. They ping each other with good-natured teasing and sing each other’s praises. Interns beg to come back, Bennett says. Bond joined the company last year after a conversation with Patrick Ahern, Brand Integrity’s Senior Vice President for Business Development. Bond helps with strategy, direction and managing the day to day, Lederman says. Bond, who had just sold his share in Bond Financial Network to his brother, had other offers on the table at the time. 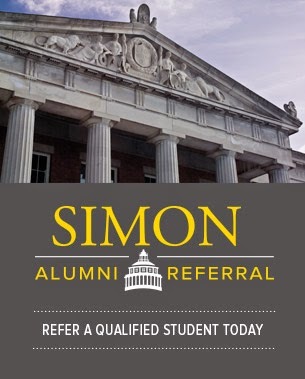 Lederman, Bennett, and Bond are all active Simon alumni. Bennett and Bond are members of the George Eastman Circle and Simon Alumni Council. Lederman continues to lecture at the Simon School, while Bennett meets with marketing students and does alumni interviewing. Bennett says Simon’s small size allowed for more interaction with professors; he also appreciated the school’s zealous grounding in economics. As for Bond, he says James Brickley’s class on organizational development, one of his favorites, foreshadowed his current work.